If we genetically modify out food, say by taking a gene from a fish, and putting it into the tomato, we’re creating a whole new species. I subbed in a fourth grade classroom recently. During a science lesson on electricity, the teacher has me show an old Bill Nye the Science Guy video. I had forgotten about the goofy Mr. Nye, but the kids were enthralled and entertained. We had a great discussion after the video building on what the children knew about electric cars and alternative energy. 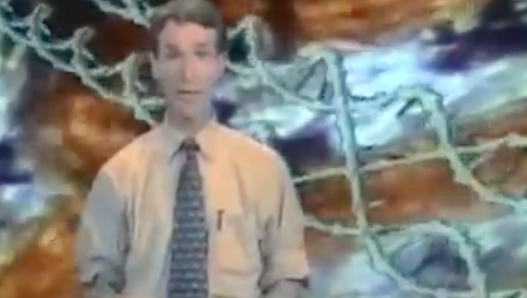 Bill Nye is still delivering accessible science information to children. I recently came across a video shared on Rodale News about GMOs and GMO Labeling. This video is ten years old, but the information is even more relevant today as states battle for GMO-labeling. It is a great one to share with your children. Certainly GMOs need to be labeled, but the video doesn’t go far enough. Kids need to be taught that GMOs cause harm so they can learn to make good choices in what they eat. I agree it could go farther. It is a good introduction though. Kids need to be taught “Just because we CAN do it, doesn’t mean we should”. And they need to be taught the very basics of biology and evolution so they can use some critical thinking skills.